I've acquired an Edo Period –apparently 17th century – Iron tsuba. -the motif of the tsuba are two sea cucumbers, which is a simple motif that has been favored by Miyamoto Musashi (1584 – 1645). -it can be seen that sword blades have actually been changed/mounted more than one time on the tsuba. It likely went through more than one owner. 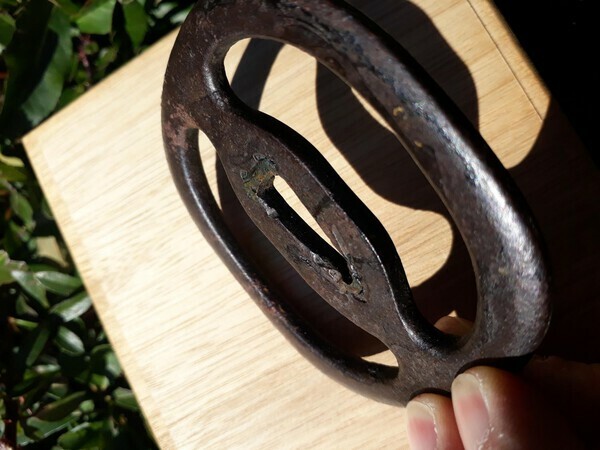 Whether or not the tsuba served in battle is difficult to prove, but since the tsuba was apparently made during the 17th century, it is possible that is has seen the last few years of feudal war before peace. 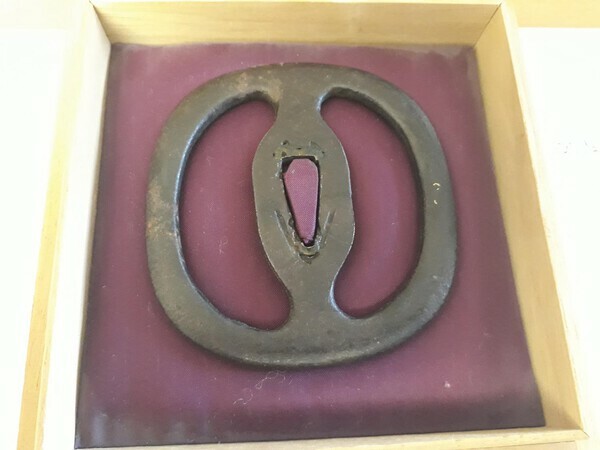 Tsuba made during the Edo period tend to be rather refined pieces of art, while this tsuba is rather practical and down to earth; which tends towards the initial owner being a warrior. best way is to take it outside and shoot pictures under direct sunlight.....not using a flash. The Musashi style is one I have always been fond of. I am still looking for the one that calls me to add to my collection. 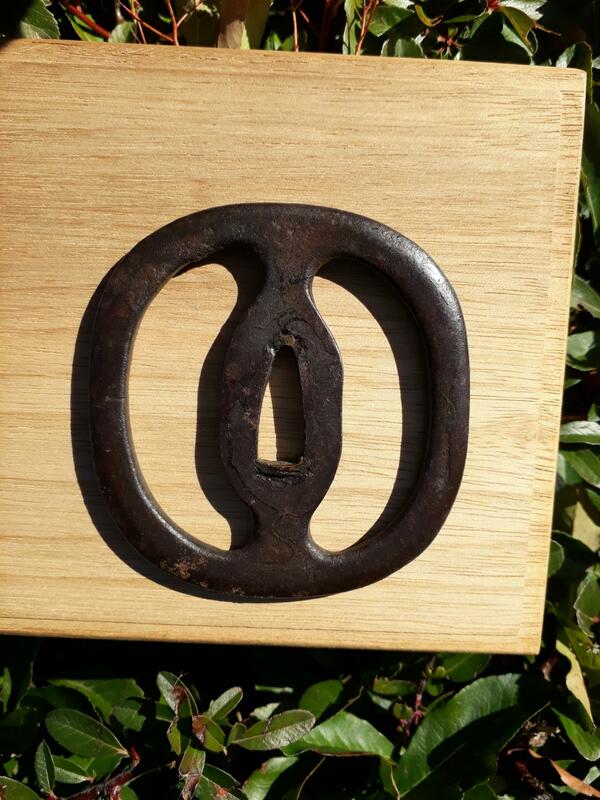 Welcome tsurugi, this musashi like tsuba is a sea cucumber style. A style I also like. Thank you guys for your warm welcome and feedbacks! Finally the sun has decided to show up, and I could take some pics with good natural lighting. 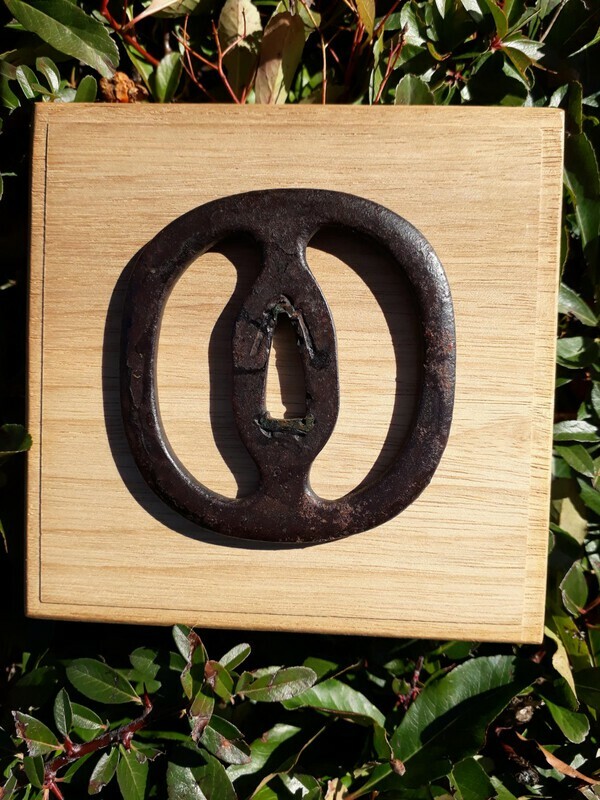 Also, I learned that the tsuba comes from the Shoami school (https://en.wikipedia.org/wiki/Shoami). Patina looks fine. What you find odd seem to be remnants of black lacquer or some other coating. Also, seppa dai in Higo tsuba have a totally different shape. 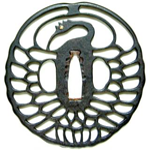 This is definitely a genuine antique tsuba, and a nice example, but it lacks the details and refinement of documented 17th century examples. Later 18th century on would be a more likely date. What details and refinement do you mean? And in resepct of which 17th c. tsuba schools? Tsurugi assumed that it was 17th century Musashi, my opinion is that it is not. Details/refinements would be the forming of the seppadai and its intersection with the rim and the forming of the rim, as I said examine the documented exemplars. Thanks Pete, right on point! Understood. Spot on, I could not agree more. Everyone, first thank you very much for all your comments and feedbacks! 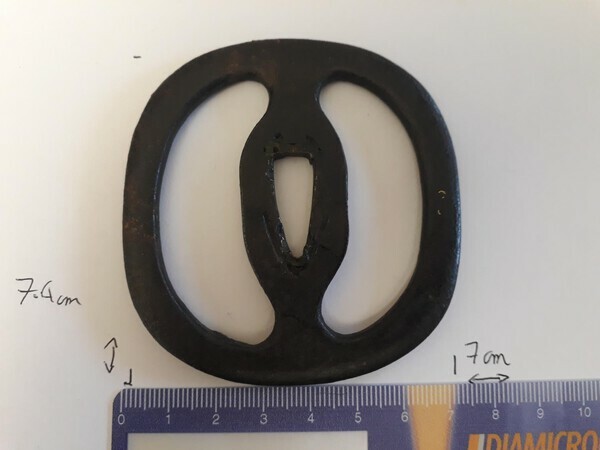 If I understand correctly, there's a general consensus that the tsuba, although being authentic, lacks the details and refinements usually found on 17th century tsuba, and is therefore more likely to be from the 18th century. Did I get that correctly? That's what Steven said. However, he refered to the famous Musashi tsuba, which your tsuba is not (neither is it a Higo tsuba). The maker (and age) of your tsuba can be determined by shinsa.